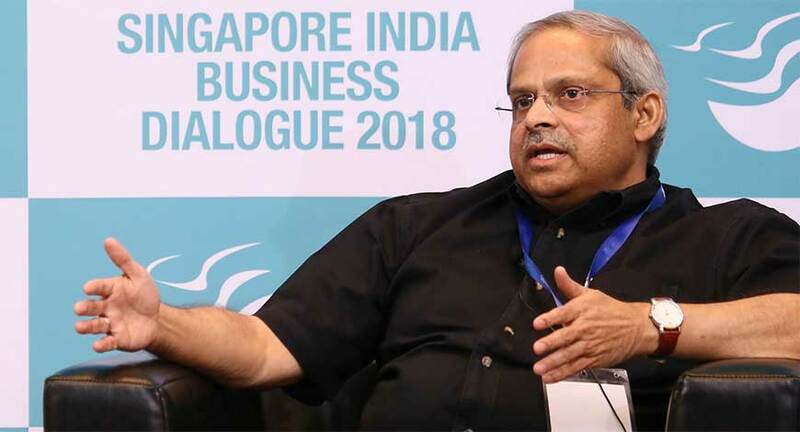 The objective of the fifth edition of SIBD was to investigate strategic responses to disruptive innovations and explore strategic partnership between India and Singapore. SIBD 2018 deliberated on three focused themes – ‘Changing Role of Management Education: Perspectives from East and West’; ‘Fintech Dialogue: Disruption or Innovation’; and ‘Strategic Response to Disruptive Innovation’. SIBD is an annual multi-stakeholder conclave bringing together policy makers, representatives from business, academic, media on a common platform to share insights and perspectives on various aspects of mutual interest. Dr. S K Joshi, IAS, Chief Secretary, Government of Telangana, in his keynote address elaborated the efforts made by the Government of Telangana in strengthening the innovation ecosystem of Telangana. “The next generation institutions created by Telangana like TASK, T-Hub, RICH and TSIHC will play a major role in managing future disruptions”, he said. Professor Rajendra Srivastava, Dean, ISB, in his address, opined that there is a need to integrate ideas from West and East, as lot of innovation is increasingly distributed globally. There is also need for convergence of ideas between industry and academia to address the complex problems that are perceived due to disruptive innovations. “Managers have to become more and more adapt to evidence based analysis”, he said. A senior delegation from Singapore Management University led byProfessor Arnoud De Meyer, President, Singapore Management University, actively participated in the deliberations of SIBD 2018. The other delegation leaders were Associate Professor Paul Robert Griffin and Professor Srinivas K Reddy among others. Offering his remarks, Professor Arnoud De Meyer said “Given the significance of the topic to both Singapore and India, we see a need to emphasise the important phenomenon of digital transformation especially in education, finance and innovation; and explore a tripartite solution between academia, industry and government towards the management of these disruptions. 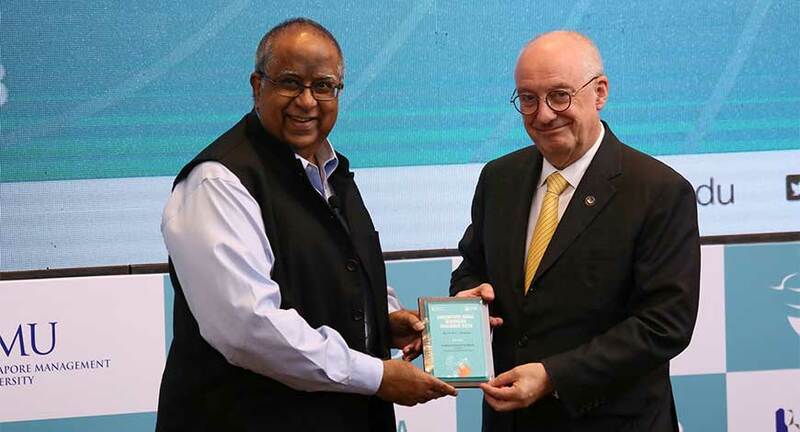 Beyond knowledge creation and contribution to society is also the Singapore Management University’s commitment to nurturing future-ready citizens who can deal with these rapidly changing times and thrive in the age of disruptive innovations”. Around 400 delegates representing industry, government and the academia actively participated in SIBD 2018. Professor Paul Robert Griffin, Associate Professor of Information Systems (Practice), Singapore Management University, in his address emphasised that decentralisation is the next big phenomena which will both disrupt and provide the ground for many innovations across all industries. “In payments we are already seeing this with the advent of crypto currencies, blockchains and smart contracts being investigated and trailed by start-ups, corporates and governments. This is just the tip of the iceberg and Singapore Management University is working with the financial industry in Singapore to delve into the real practicalities of how to reap the benefits and uncover the risks with solid research from business, governance and technical aspects”, he said. Professor Srinivas K Reddy,Professor of Marketing, Singapore Management University, in his address mentioned that based on research and analysis, it is found that if the response to perceived disruptions are either aggressive or lukewarm, the impact ends up to be negative. “We must look for solutions which are neither aggressive not lukewarm”, he said.